Why Vietnam is the new China for the global electronics giants | What Hi-Fi? There's a problem with China. It's not the oft-rehearsed arguments about British jobs being exported there, products bearing 'once-great' British names being made in Chinese factories or even whole British companies falling into Chinese hands. No, the problem with China is that it's getting a bit too expensive for its own good, thanks to rising standards of living, the demand for production capacity there, and the growing aspirations of Chinese workers – they're now not just making the products we all buy, but thinking of being able to buy them, too. And that's leading ever more companies to look for new countries in which to manufacture, with serious investments being made in the likes of Brazil - where one company is planning five new plants – and Vietnam, the target of substantial further investment from South Korea's two consumer electronics big-hitters, LG and Samsung. It's one of the clichés of the modern age: products once made by proud British craftsmen in brown shop-coats and flat caps, the stub of a pencil behind one ear and a roll-up behind the other, now being put together by slave-labour Chinese teenagers working night and day for a pittance. The truth – as in this IAG factory where Audiolab, Quad and more are made – is often far from that myth, but the fact remains that yes, Chinese wages are still much lower than in Europe or the US, for example. However, they have been rising, and fast – by up to 20% a year for the past half-decade. For example Foxconn, the Taiwan-based company that's both one of the biggest employers in China, with a million-plus-strong workforce in its 13 factories there, and one of the best-known – due to the fact it makes iPods, iPhones and iPads alongside Kindles, Wiis and PlayStations and much more – , hiked its workers' wages by 16-25% last year. That was just the most recent of several wage increases on a similar scale, and such rises have led some economic forecasters to suggest that China is in great danger of pricing itself out of the market, predicting that the cost of manufacturing there could double, or even treble, by the end of this decade. Indeed, some commentators even suggest that if the costs of shipping, and Chinese workers' wages, continue to rise as they have, within a few years it's going to just as cost-effective to make products in North America as in China. Certainly the companies once looking to China for cost-effective – oh, OK then, cheap – manufacturing are casting their net wider. Foxconn has announced that, although it's planning more factories in China, it's investing almost $500m in five new plants in Brazil, creating 10,000 jobs, and three more in Malaysia, to add to other operations in the Czech Republic, Hungary, Slovakia and Mexico – not to mention the joint-venture Sharp LCD plants in Japan, which it now more or less runs, and which it is expected to acquire completely at some point. And for both LG and Samsung, Vietnam seems to be the new frontier: both companies already have plants there; both are planning significant investment and expansion in the country. LG is already manufacturing all four of its major product lines – TVs, fridges, washing machines and air conditioners – at factories in Vietnam, but is now set to invest $300m in a new plant in Haiphong, the country's third city. The new facility, set to be up and running by 2020, will enable LG to integrate its existing operations in the port city, east of Hanoi, and surrounding areas, enabling it to meet growing local demand as well as having capacity for exports. It's also considering the manufacture of mobile phones at the facility. The plan will see production being shifted from China to the new plants, LG citing lower labour costs and the availability of skilled workers, and the company hopes it will be sweetened by Vietnamese government incentives including reduced prices for land leases and extended exemptions from corporation tax. Not to be outdone, Samsung already has in place plans to build at least one more plant to assemble mobile phones and other hi-tech electronics in Thai Nguyen province, north of Hanoi, and possibly a third. It already has a factory employing 24,000 and making 11m products a month in Vietnam, and expected to export goods worth $10bn this year. 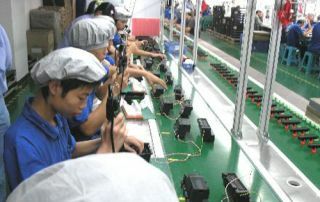 Since opening that first plant (above) in 2009, it has just about doubled output each year, although some Vietnamese commentators question whether this is giving the country a mobile phone industry, or just an assembly one for foreign investors. One expert on the country's mobile phone industry last year bemoaned the fact that only the plastic casework for mobile phones was actually manufactured locally, and accounted for just one percent of the value of the finished product. Samsung's new plant in Thai Nguyen, the land lease for which was signed a couple of weeks ago, is the subject of a $700m investment, with Samsung chairman Lee Kun Hee, seen above visiting Samsung's existing production plant in Vietnam, saying that there are plenty of further opportunities for investment in the country. He's probably right – after all, economic analysts are already describing Vietnam as having the potential to become the 'new industrial factory of the world'. The process by which recent industrialisation started in Japan, moved to South Korea, Taiwan and the like, then on to Malaysia, Indonesia and Thailand, and has settled for now in China. will, it seems, just keep on rolling. Writing this piece, I couldn't help but be reminded of a press trip to the Far East many years ago, when a number of journalists were helicoptered into a factory in Thailand – one of three we visited that day owned by a Japanese company making speaker drive units. One of our number commented on the large number of young Thai women working on the production lines, and our host, the factory boss, explained to us that they were brought in from agricultural areas all over the country. They'd never left their rural homes before, had taken some time to adapt to the conveniences of modern living – especially the 'conveniences', our Japanese host stressed – and had been specially chosen for their small nimble fingers, especially suited to handling the tiny precision components used on the lines.